Let's set aside the earthquake of Justice Kennedy's retirement for a moment, and think about the major decision that was handed down today. Every Supreme Court term features a relatively small handful of highly-anticipated and hotly-debated cases, and this session was no different. While much of the media's attention has focused intensely on the Court's decision to uphold 'Travel Ban 3.0,' that one isn't -- or shouldn't be -- the signature ruling of 2018, in my view. Whether or not one supports the administration's underlying controversial national security policy, once initial problems were ironed out and the policy was revised to become "facially neutral," it was clearly constitutional. Effectiveness and wisdom are not synonymous with constitutionality. Even many of the decision's harshest critics have conceded that the administration's action would have passed muster under the law if it had been implemented by another president (they argue that Trump's 'Muslim ban' campaign rhetoric evidences discriminatory intent). Here's a good explainer on why the Court's eventual conclusion was constitutionally correct. We are a nation of laws, not men, and the law on this point is unambiguous. 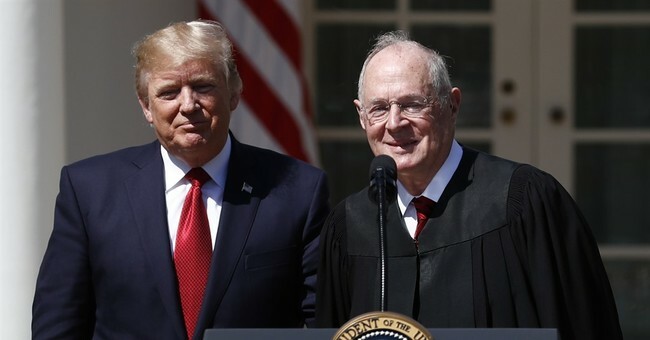 On the same wavelength, Hot Air's Ed Morrissey fleshes out the point: "The Supreme Court finished its 2017-18 term with a bang today in Janus v AFSCME, a ruling which may well transform electoral politics. However, the court’s term — and Janus itself — have deeper implications for free speech and the relationship between individuals and the government, and for that matter between the judiciary and the legislature as well as the people. In its final days...the court has made a powerful case for individual speech and has gone a long way toward deconstructing the levers of government-compelled speech," he writes. The Masterpiece Cakeshop ruling (and a remanding a related case involving a Christian florist) were narrow victories for First Amendment liberties, even if many pro-liberty advocates were disappointed by those decisions' limited scope. But the alternative would have been far worse, and Kennedy's upbraiding of Colorado's 'human rights' kangaroo court over its overt hostility to religion was a welcome development. It is forward thinking to begin by reading the First Amendment as ratified in 1791; to understand the history of authoritarian government as the Founders then knew it; to confirm that history since then shows how relentless authoritarian regimes are in their attempts to stifle free speech; and to carry those lessons onward as we seek to preserve and teach the necessity of freedom of speech for the generations to come. Governments must not be allowed to force persons to express a message contrary to their deepest convictions. Freedom of speech secures freedom of thought and belief. This law imperils those liberties. The Supreme Court delivered a major blow to public-sector unions Wednesday, ruling that they cannot force government workers to join or financially support them. The 5-4 ruling in the case, called, Janus v. American Federation of State, County and Municipal Employees, by the court's conservative wing overturned a four-decade-old precedent and affects about seven million people. Union leaders expect the ruling to result in major membership losses and drained treasuries as workers, who previously had no choice, start opting out of being involved with unions. Inherent in many anti-Janus gripes is the nasty little assumption that gov't workers cannot determine what is in their own economic self-interest. If their unions were representing them well, and the (uncoerced) investment was worth it, said unions would be fine, not "crippled." In summary, the Court ruled that Colorado gravely overstepped in punishing an orthodox Christian business owner for his religious beliefs (even while punting on the core issue), that California violated pro-lifers' rights by compelling pro-abortion speech, and that government sector unions cannot require those public employees who supposedly 'benefit' from their collective bargaining agreements to contribute money to partisan causes that heavily benefit one political party. The degree to which this could hurt Democrats (reminder: money can't necessarily 'buy' elections) merely further exposes what an astonishingly lucrative racket the previous status quo was for that party. But that partisan byproduct is secondary to the speech implications considered by the Court. Don't believe him (or me)? Read this and this. The record is quite clear. And now, the stakes are again very high.